Expect the unexpected in hip-hop artist Boots Riley’s critically acclaimed directorial and screenwriting debut, Sorry to Bother You – an outrageously surreal look at capitalism, corporate greed, and fractured workplace dynamics. 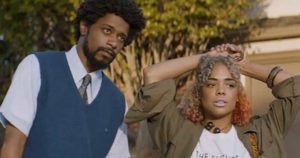 In an alternate present-day version of Oakland, California, struggling telemarketer Cassius Green (Lakeith Stanfield) discovers a magical key to professional success, which propels him into a macabre universe. This comedy baby received a staggering 94% Fresh rating at reviews aggregator Rotten Tomatoes based upon 191 published write-ups!